I have a little golfer on my hands. 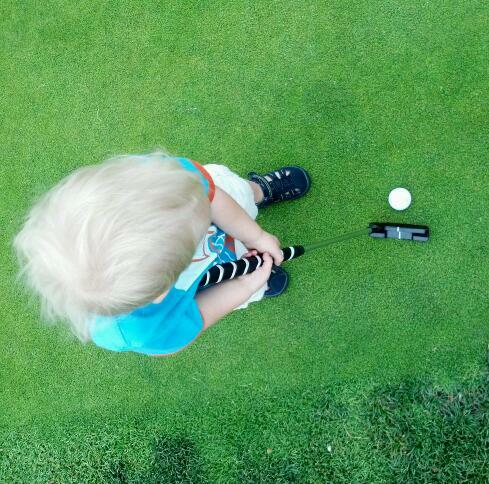 I took this picture of him at the driving range, actually on the putting green if you want to get all technical. The grass is so green it looks fake....Anyway, thought I'd share. What is your toddler obsessed with these days? Barbies, her bike and makeup - Oy, the make up that she comes up with some times...big sigh. I currently have red lipstick kisses on my walls - no, magic eraser does not get them off. Thanks for the comments Dari! Girls are funny that way, though I have to say my son gave himself a mani yesterday. Good thing I caught him or that pink polish would have been EVERYWHERE!